As 2013 Approaches Is Your Mind Open To A Radical New Future ? Our culture is increasingly digital, millennials are a larger global group than boomers so consumers are changing, and technology is revolutionizing industry after industry. When looking ahead to 2013 and beyond, how can you keep pace with the massige degree of change that is happening and is only going to increase ? The answer lies in keeping an open mind. In my past post, How Does The Fitness Industry Change Its Mindset, I share specific examples of how organizations can maintain openness while forever searching the horizon for what is emerging. 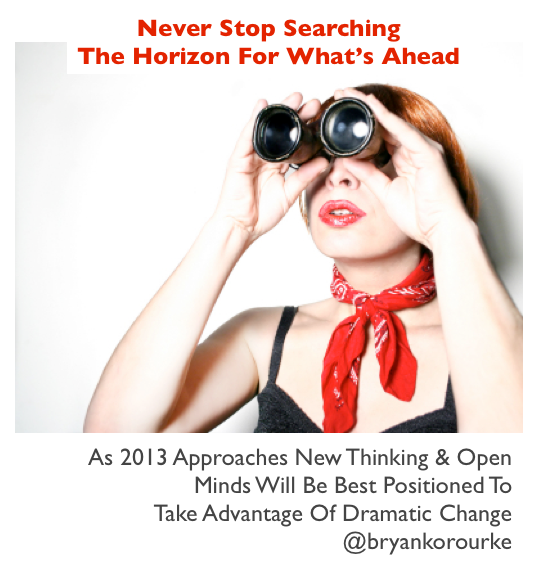 As you prepare for 2013 how are you keeping an open mind ? Watch Google's recent Zeitgeist 2012 video for a year in review below. I think it provides a great perspective and is evidence that the world is indeed changing at a breakneck pace. Keep on searching. I look forward to your thoughts.